How Long Does It Take to Complete an Employee Survey? 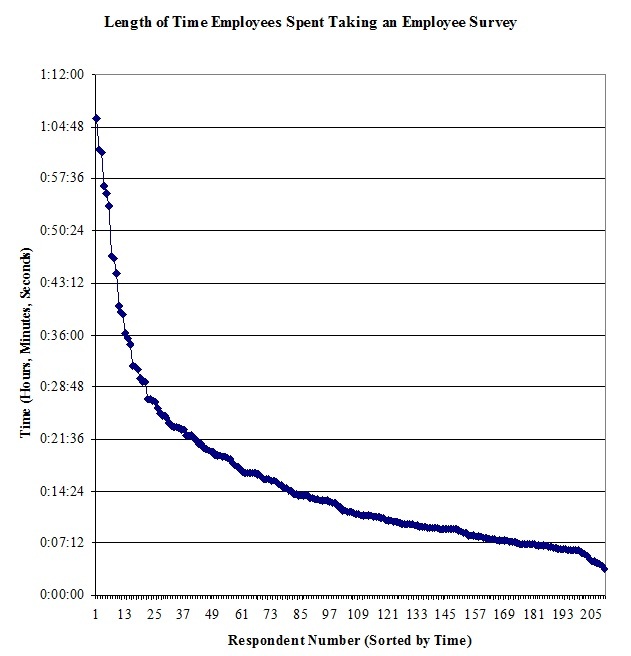 We often get asked by new clients how long it takes for employees to take a survey. It’s a legitimate question, because a large part of the cost of a survey like this is the employees’ time. How much time does it take, then, for employees to provide the data necessary to identify the items that need to be improved in order to boost employee engagement? The short answer is: 16 minutes and 58 seconds. The longer answer follows. Median (the point where half are above and half are below) length of time respondents spent on the survey. Number of open-ended questions (asking for employee comments). In the above graph, created from a recent survey, three people took just over an hour until they clicked the “submit” button. From there the length of time declined rapidly until it began to level off in the 15 to 20 minute range. 10% of people spent seven minutes or less on the survey. The average time spent was 15 minutes 33 seconds. The median was 11 minutes 29 seconds. Next we ran a regression analysis of the random sample of employee surveys we recently conducted to determine the extent to which the number of scale questions and the number of open ended questions affects survey length. Here is what we found. The baseline time to complete a typical employee survey of ours is 13 minutes and 12 seconds. Each incremental scale question adds just over two seconds to that time. Each incremental open-ended (comments) question adds 43 seconds to the average survey length. This includes employees who made comments and those who didn’t, so the average among employees who made comments will be higher than 43 seconds*. With this information in hand, it’s easy to calculate that an employee survey we typically recommend with 65 scale questions and two open-ended questions will take, on average, a hair under 17 minutes. A longer survey, with 85 scale questions and four open-ended questions, would take just over 19 minutes. This means that employees do not have to carve out significant portions of their workdays to take a survey. It also means that severely cutting the survey length in an attempt to reduce employee survey time results in very little time savings, but at a cost of missing valuable information.